In The Tell-Tale Brain, world-famous neurologist V.S. 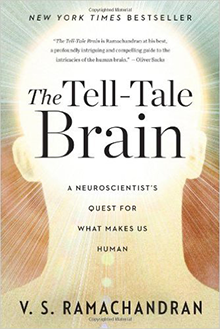 Ramachandran draws on compelling cases of strange and unusual brain function to shed light on how a normal brain works. He does so as a mechanism for ruminating on his central question: what is it about the brain that has driven humanity’s unique evolutionary trajectory, that separates man from beast? It’s a big question, and each reader will have to decide how well Ramachandran answers it.